Jhabua Trophy CPL'18 : Index Knight Watchers won the tournament! 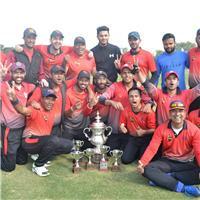 Final played between Rising Phoenix vs Index Knight Watchers on December 25th at Scindia Ground. Jhabua Trophy '18: Rising Phoenix first finalist. Jhabua Trophy'18 : II. Index has scored 57 runs in 10 overs at a loss of 2 wickets. Jhabua Trophy'18 : All Star Gladiators 83 runs in 13 overs at loss of 6 wkt.